As a pianist specialising in British and Irish music, I first noticed the name of Archy Rosenthal as that of the dedicatee of two of E.J. Moeran’s liveliest piano pieces. Later, as a frequent visitor to Dublin, I encountered Rosenthal in archive material detailing that city’s vibrant musical past, and I noted references in the pages of historic journals at home and abroad to this character whose illustrious career spanned more than half a century. I was intrigued on several counts: here was a virtuoso pianist who had also been a composer, a vigorous and engaging figure who had moved amongst the leading musical and artistic personalities of his day and a restless spirit who had never stayed in the same place for long. An Irish Jew by birth, whose relaxed and gregarious whimsy was bred in his native city of Dublin, Rosenthal grew to maturity in the stimulating cafe culture of fin-de-siècle Vienna. Although chiefly a solo performer of international fame, he composed prolifically and his works are stylish, lyrical and beautifully crafted, combining Celtic melancholy and wistful, yearning melodies with the schmaltz and gemütlichkeit of the Austrian capital. Laced with the inflections of reels, jigs and waltzes, Archy Rosenthal’s music is perhaps the aural equivalent of a substantial helping of Sachertorte washed down with a shot or two of Irish Mist; it transports us into the graceful, elegant world of a bon viveur who liked to tell his family and friends that “the luxuries of life are my necessities”. This summer I have the privilege of reintroducing Rosenthal’s work to a world which has long forgotten him. My CD, An Irish Idyll, to be released in June on the EM Records label, takes his piano music as its central focus and, as a prelude to the disc, I shall be playing several of Rosenthal’s most attractive and invigorating pieces at the English Music Festival this month. In the audience will be Rosenthal’s grandson, Mark Bredon, rediscovering the lost world of an elusive and mysterious grandfather who left for Australia when he was an infant and whom he never saw again. Archibald Joseph Rosenthal was born on the 8th November 1874, at 80 Harcourt Street, Dublin. This sought-after address, an imposing residence set in an elegant Georgian street of the kind for which the Irish capital is justly renowned, gives a clue to the genteel prosperity which characterised Archy Rosenthal’s family background and early life. John David Rosenthal (1833-1907), the composer’s father and a prominent solicitor, was himself born in Dublin, where he was the first Irish-born Jew to obtain a law degree and where he subsequently practised for many decades. Archy’s mother, London-born Minna Solomons, was the daughter of Benjamin Solomons, an optician and telescope manufacturer with business interests in London and Dublin. John David and Minna were married at the Great Synagogue, London, on 10th October 1855, from Minna’s father’s address at 39 Albemarle Street, Mayfair. The composer’s paternal grandfather, Henry (or Heinrich) Myer Rosenthal, was born in Hamburg in 1798 and settled in Dublin in 1827, with his English-born wife Esther, attaining prosperity as a tobacco and cigar merchant. Henry resided at addresses in College Green and Nassau Street and owned property in the vicinity of St Stephens Green, taking British nationality in 1848 and dying in Dublin in 1873. His widow, Esther, went to live with her daughter Rose in Birmingham, where she died six years later. Her youngest grandson Archy, back in Dublin, was just four and would barely have remembered her. Archy was not the only member of the Rosenthal clan to demonstrate musical talent, but his pianism was soon to win him renown beyond Irish shores. After Shrewsbury School he studied in Vienna with the legendary Polish pedagogue Theodore Leschetizky, whose pupils included Paderewski, Schnabel and Moiseiwitsch. Under Leschetizky’s inspired guidance Rosenthal seems to have blossomed as a virtuoso of distinction, but the Viennese master was not the only great teacher to exert a profound and permanent effect upon the young Archy’s musical development. From the year 1900 he also worked in Berlin with the Lithuanian-born Leopold Godowsky, renowned as a pedagogical theorist and for his predilection for spinning pianistic confectionary of remarkable complexity and difficulty. The young Rosenthal was bewitched by the Central European cultural milieu in which he became immersed, and it was probably during his extended continental sojourn that the young pianist made the acquaintance of the composer Edvard Grieg, who later stayed with him when visiting London. It was probably in Berlin that Archy met Hilda Mary Hill Gee, a young English violinist who studied in Germany and knew Brahms. Archy and Hilda married in 1901 and settled in North London, where their children were raised in their mother’s Anglican faith. The Rosenthals maintained a vibrant social life, entertaining many of the leading artistic and musical figures of the day. Archy held a professorship at the Royal Irish Academy of Music in Dublin, and was for eleven years a Senior Professor of Piano at London’s Trinity College of Music. He toured extensively as a solo pianist and took private pupils, whilst his own piano compositions gained widespread popularity and were widely published and performed. Archy was on the artist list of the exclusive London agency Ibbs and Tillett, and engagements included frequent “celebrity tours” of continental Europe, whilst at home in London the critic of the Daily Telegraph wrote after one of his recitals: “To play the piano is for him a function as natural and ready as ordinary speech.” In 1914, having a German-sounding name became a problem and, during the Great War, publicity for Rosenthal’s recitals added as a footnote: “Mr Rosenthal is British, both by birth and parentage”. In the 1930s, Rosenthal’s descendants changed their surname to Bredon, but Archy maintained his original family name. So what of that music? Among his finest creations is the exquisite Barcarolle, of which Neville Cardus wrote that “there is a gorgeous sort of elegance and perfume in this miniature of grand gestures”. The delicious Irish Pastels evoke a Celtic spirit, but it is two big sets of variations which show Rosenthal at his most ambitious and strikingly effective. It is one of these which will close my recital on May 24th, and which bears witness to an especially personal and poignant tale. The Variations on a Nursery Rhyme “Hush-a-Bye-Baby, On the Tree-Top” were composed in London in 1932, following the birth of the composer’s grandson, Mark. 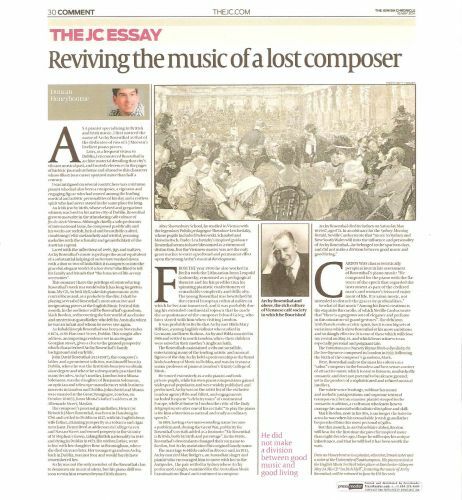 Here, Rosenthal nails to the mast his colours as a “salon” composer in the broadest and best sense: a writer of attractive music which is easy to listen to, unabashedly romantic and does not pretend to break new ground, yet is the product of a sophisticated and refined musical intellect. The subtle voice-leadings, sublime harmonic and melodic juxtapositions and supreme textural transparency betray a master pianist steeped in the romantic tradition, a craftsman who knew how to manage his material with infinite discipline and skill. Mark Bredon, now in his 80s, is no longer the babe-in-arms he was when his remarkable Jewish grandfather bequeathed him this most personal of gifts. But this month, in an Oxfordshire abbey, Bredon will hear for the first time the piece he inspired more than eight decades ago. I hope he will enjoy his unique inheritance, and that he will feel it has been worth the wait. Duncan’s piano recital at the English Music Festival took place at Dorchester Abbey, Dorchester-on-Thames, Oxfordshire, on Saturday 24th May 2014. His CD An Irish Idyll, featuring the music of Archy Rosenthal, was released in June 2014 by EM Records.